Inter-Generational Love – bronze sculpture by Marion Bartlett – 2016 – Holland Christian Homes, 7900 McLaughlin Rd S.
City of Brampton has a Public Art Self-Guided Tour. You can easily see all of BikeBrampton’s top 5 picks from the comfort of your bicycle. The top featured image was taken in Gage Park, 2016. 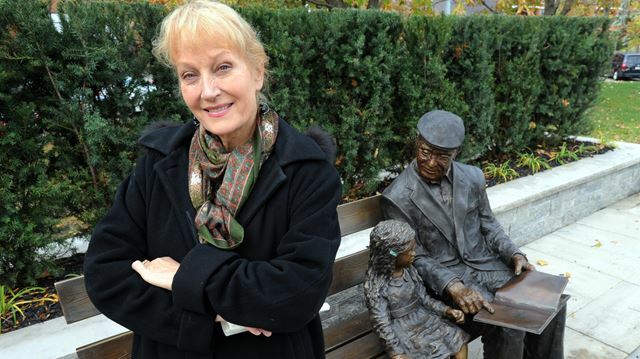 Radhika Panjwani of The Brampton Guardian published a lovely story about Marion Bartlett’s sculpture unveiling Nov 2, 2016. Photo courtesy of Rob Beintema, Metroland. Join this club to help BikeBrampton track Brampton’s collective cycling mileage!